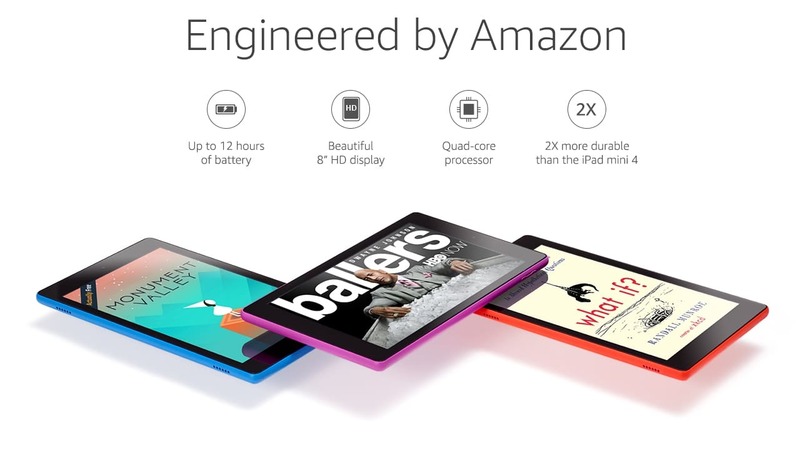 Amazon has just announced a new Fire 8 HD tablet that is currently available for pre-order for $89.99. This new device will start shipping out on September 21st. The Fire 8 HD features an 8 inch screen with a resolution of 1280 x 800 and 189 PPI. Underneath the hood is a Quad-core 1.3 GHz processor and 1.5 GB of RAM. There are two different options for internal storage: 32 GB or 64 GB. There is also an SD card so you can increase it further. I think SD cards on Fire Tablets are a bit more relevant now because you can store your e-book collection, videos and music on them. The big selling point about this new Fire 8 HD is that it will be the first Amazon branded tablet to have the Alexa voice assistant. Alexa provides quick access to the entertainment you want, including music, games, audiobooks, and more. You can also ask Alexa questions, check your calendar, get news, find sports scores, and even control your smart home. All you have to do is press and ask. Alexa will be available via a free over-the-air software update in the coming months. If you have a Fire 8 from last year, this new model basically has 12 hours of battery life, 50% more RAM for faster performance, and 2x the on-device storage, plus support for up to 200 GB of additional storage via a microSD card, in addition to Alexa. Well worth the $89.99 asking price.